I always enjoy a trek hiking the bluffs of Mackinac Island looking out across the water of the straits where the Great Lakes of Huron, Michigan and Superior come together. It is always a relaxing experience hiking through this tranquil setting full of impressive natural scenery. Unfortunately, often times there is one major drawback that puts a damper on an otherwise fun time leaving you itchy and welted by the conclusion of your hike ... the forest full of mosquitoes. The island may not have bears, lions or snakes to fend off but the wet and shady habitat at this Michigan state park makes a perfect breeding ground for pesky mosquitoes looking to steal a bit of your blood. Ugh! if you are lucky you'll only be left itching for a few days and being unlucky could lead to a more serious problem like an infection of the West Nile Virus or a case of Encephalitis, among other illnesses. I've used a variety of bug deterrents when going on hikes in the woods with mixed results over the years. 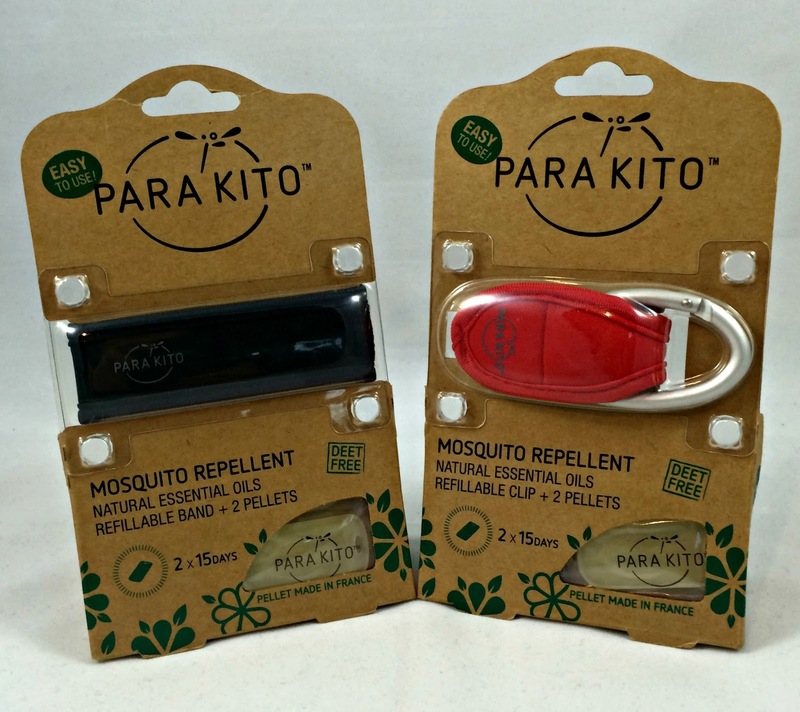 For my most recent trip to Mackinac Island, I took along with me some samples I'd been sent from PARA'KITO MOSQUITO REPELLENT to try out knowing that it could really come in handy based upon my past treks. During my hike, I wore a wrist band and had a clip on my backpack that each contained a pellet filled with oils that interfere with mosquitoes sense of smell reducing the critters capacity to identify you. I was a bit hesitant that this simple sounding solution would work, but PARA'KITO passed the "smell test" as I made it through my hike relatively unscathed without a noticeable mosquito bite. With people having renewed concerns about mosquito-born illnesses due to the recent Zika Virus outbreaks as well as a societal trend to avoid physical interactions with harsh chemicals, PARA'KITO uses all natural-based active ingredients to ensure that its products sufficiently protect people from mosquitoes without the use of chemicals that could potentially cause their own negative health side effects. PARA'KITO mosquito repellent is DEET, parabens and phthalates free. It's mosquito repellent pellets made from a mixture of Citronella, Rosemary, Geranium, Mint, Clove, Peppermint and Cinnamon oils provide consistent protection for up to 15 days. When they've worn out just pull the pellet out of your refillable band or clip and slip in a replacement. Refills can easily be ordered online and shipped to you. Refillable bands made from neoprene can be worn on wrists or ankles are available in sizes for both kids and adults in a variety of shades and designs. Kids designs feature pandas, pirates, monkeys and sharks. Adult colors and designs range from standard black or blue to cosmic purple or camouflage among a variety of selections. Clips are easy to use too - place them on strollers, bikes, backpacks, belts or purses among other things to keep the mosquitoes away. Also stop by the PARA’KITO Facebook page this summer for a chance to win their weekly contest on its Facebook page. 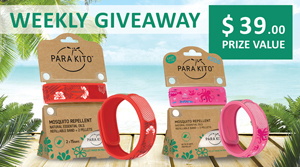 Starting the week of June 20 through September 21, PARA'KITO will give away two wristbands (a $39 value!) to one lucky Facebook follower! Entering to win is easy! First 'LIKE' the PARA'KITO USA Facebook page. Then visit PARAKITO.com and share your favorite product from the collection in the COMMENTS section of the weekly Facebook post PINNED at the top of the Facebook page. Be sure to use #PKgiveaway in your response. Around 4pm ET each Thursday, they'll announce a weekly winner!